There is compelling proof of extraterrestrials in several photos, says a retired US naval officer who claims he saw them during his years in service. The officer, who wished to remain anonymous, said he was aware of alien activities, including the famous mass UFO sightings of Rendlesham Forest in Suffolk, England, in 1980. While admitting he has never seen an extraterrestrial or UFO in real life, he told The Express newspaper, a British tabloid, that he had seen literally tens of thousands of documents that clearly confirmed they really exist and have visited us. According to the US navy veteran, during his career he had handled the secret documents at Naval Air Station Moffett Field from February 1986 to October 1989. Within those documents, he claimed there were pictures of aliens as well as their spacecraft. He insists that governments across the world do not want us to learn about what really happened. He said he once met a senior officer who had been deployed in the Rendlesham Forest, where US Air Force personnel including Deputy Base Commander Lieutenant Colonel Charles Halt claimed to see what they described as a UFO. Last year, there were rumours that the UK Ministry of Defense was planning to declassify documents related to several UFO sightings, including the famous one in Suffolk. What happened at Rendlesham Forest in 1980? During the Christmas holiday period of 1980, there were a series of reported sightings of bizarre lights near Rendlesham Forest. 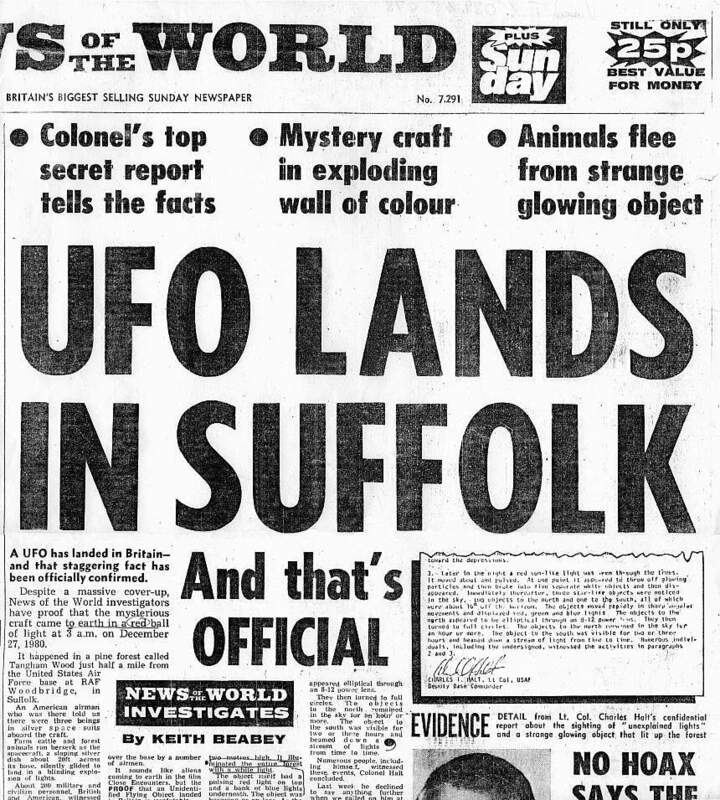 The events happened just outside RAF Woodbridge, which was used at that time by the Air Force of the US, many of whom swore they saw bizarre UFOs. The Rendlesham Forest incident is the most famous alleged UFO event ever to have occurred in the UK, ranking among the most prominent UFO events globally. It has rivalled the Roswell UFO incident in New Mexico, USA, and is sometimes referred to as ‘UK’s Roswell’. The Ministry of Defence insisted that the event posed no threat to national security, which meant it was never ‘officially’ investigated as a security concern. Local and national authorities insist that the sightings were a misrepresentation of a series of nocturnal lights – a fireball or a series of bright stars. The official explanations of what had occurred were flimsy, to say the least, said several scientists and alien enthusiasts. Local Suffolk Police were called to the scene on the night of the first sighting and again the next morning, but found nothing untoward. On the night of the initial incident, they reported that the only visible lights were from the Orford lighthouse. They said the indentations on the ground were caused by animals. Space music that could not have come from Earth shocked three Apollo 10 astronauts in 1969 while they were orbiting the Moon on the far side – when radio transmissions from Earth are blocked. The amazed crew members heard the mysterious space noises through their headsets and even talked about whether they should report it or say nothing. They knew the mysterious sound could not have come from their home planet. This occurred forty-seven years ago, during a mission in preparation for the Apollo 11 Lunar Landings when the first man set foot on the Moon. NASA had put a lid on the occurrence for over four decades. It was not until 2008 that the recordings and documents were declassified and members of the public got to hear about it. Since then, researchers as well as lay people have been debating about where that bizarre music could have come from. Now that most people have a smartphone with in-built camera, and the number of sci-fi movies and series on TV and in the cinema has increased dramatically compared to 1980, reports of UFO sightings and alien encounters have exploded. See our webpage on UFO and alien news. Col. Charles Halt, who claims he saw the UFO, says he has obtained new evidence regarding the mass sighting.